Orders are now being taken for our spiritwear! Don't miss the Friday, November 21st deadline! It's easy! You can place an order either online or by using the order form below. Send in your order form, along with your cash or check payment, to your child's teacher. Checks can be made payable to "Park Campus PTO". To use a credit card, place your order online at http://www.AmericanOutfittersLTD.com. 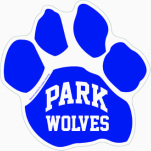 Select "Park School" from the list on the left or look for the "Park Wolves" icon. Online orders can be placed until Sunday, November 23rd. All items will be delivered to your child's classroom the week of December 8th. Unfortunately, we will not be able to accept paper orders after Friday, November 21st. Online orders can be placed until Sunday, November 23rd. Because most of our items require a minimum purchase from our vendor, we cannot submit individual orders. If you missed this sale, don't worry! We generally offer three Spiritwear orders a year - Fall, Winter, and Spring. Most non-apparel items can be purchased anytime from our Online Store and are available for immediate delivery. The PTO Online Spiritwear Store is open during all non-order times!